He’ll be going as a 15 month old BOY. Now, if the temps would just drop below 90. Exterior paint and doors post coming soon. My sister-in-law made our ghosts and dropped them off outside our door a few weeks ago! What a pleasant surprise they were! Aren’t they so fun!? She made them with white felt and they are sitting on upside-down tomato cages… I added the lights for a glowing effect! Ohh your decorations look absolutely marvelous. awesome. I love it all. I bet your children love it all. My nephew LOVES holiday decorations. So cute! I love the wreaths and the pumpkin lights hanging from the ceiling. 🙂 Poor JM, his eye just breaks my heart! that was a rough fall! It all looks like such fun! I cannot wait to see the exterior reveal! Cute Halloween decorations!! We love Halloween, but I am not much of a decorator. I may have to try the ghosts. Love the candy corn banner too. i love it! everything is super adorable!!!! your kids must love the ghosts with their names on them. cute idea! 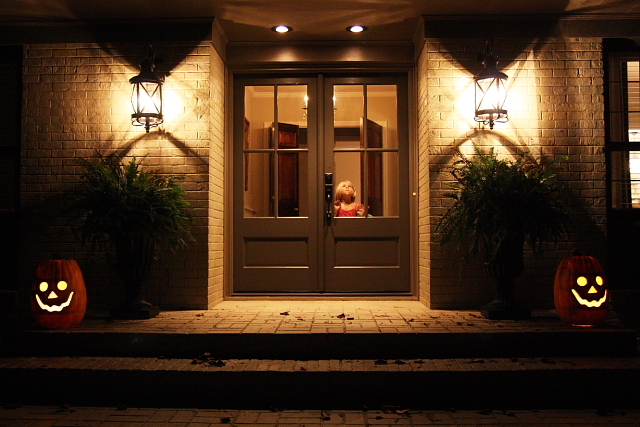 Your front entrance is so beautiful and inviting – love it!! While watching DIY last night I saw your orange bath! That first pic popped up and I was like, “hey, I’ve seen that somewhere”! Loving the holiday decor and I love those exterior lanterns, we almost bought the same ones! Perfect combo: totally elegant yet welcoming and fun! I’m in the Uk and am gobsmacked that your preparations for halloween are started so early ! and on such a grand scale. The churches here are beginning to offer children alternatives to Halloween such as ‘Light’ parties, as they don’t like the children celebrating evil spirits. I think they’ve probably lost that battle before starting it !! That is so cute!! That makes me wanna go out and get some things to decorate my house RIGHT NOW!! Love it! Love it all and your house looks great! Everything looks great! Will your sister-in-law do a mini tutorial on the ghosts…..????????? I want to make them!! Totally agree with one of the earlier comments. Your decorations are fun, yet elegant. So many people go WAY overboard with Halloween decorations, and it just looks tacky! Oh my goodness those are just too cute. I just called my daughter and told her we have a weekend project now to call papa at work and tell him I need some of those cages. Love the new entryway it looks great. Those doors are making me want to RIP mine off their hinges!! So pretty, now if I could talk the hubby into it. Though I am not sure they could withstand our brutal winters!! Love the candy corn, love it all very M.Stewartish. My son decorated his room with spiders and rats last night (they can only come out when pranking MeMa 🙂 How are those doors working for you?We have debated the 15 lite door, but people will be able to see in like were in a fish bowl. So we may plant new trees right in front. Let us know how you handle it or if you worry about that at all. PLEASE!!!!!!! That is all so cute I can’t stand it!! Love it all so much! Your doors and lights look fabulous!!!! LOVE LOVE LOVE the outside of your home! I can’t wait to see the whole project! BTW how do you keep your ferns so big and pretty? Mine ALWAYS seem to struggle and never grow. I love the pumpkin lanterns! JM can be a “Black Eye P” for Halloween!!! …Just put a “P” on his shirt!!! So festive! Love it all! I just love it! My twins are 15 months old and they worry me so much when they take a spill and fall down. The doors look great. Do you think you’ll frost the glass or do a curtain fabric overlay? What a shiner! Such a boy 🙂 I actually did like your old doors- but now I love your new ones! Wow, you really are ready, well done! Looks beautiful! Love the decorations! Where did you find the chinese lantern-ish jack-o-lanterns? Haha, I was thinking along the same things as Melanie… the Rover can be a Black-eyed P. Although it will probably heal nicely by the 31st. I love your new doors! I originally wanted doors like that, but decided on a solid door last minute. Seeing your home makes me wish I would have thought about that a little harder! Looks great!! Darby it looks amazing! I reallly really like your new doors! The ghosts are too cute, also. Very cute! The doors look great. I love all of your decorations! The ghosts are adorable. Your house is gorgeous, too! when my little girl was 17 months at halloween, she went as a black eyed pea for the very same reason. she fell down days before our big halloween party after i had spent hours making her an adorable (if i say so myself) peppermint costume. it just didn’t “go” with the black eye. so on the way home from the ER after she fell, i decided she would be a black eyed pea. she wore black pants, a long-sleeve onesie that i put a huge P on and pigtails. she had a ball at the party, black eye and all. whatever you decide to do, i’m sure will be so much fun!! Everything is beautiful! Love the decorations especially the ghosts! Where did you get your paper ball jack-o-lanterns? Love them! Poor little guy! West gets his cast off today ( 22 months old ) . We are ready for fall also, with our decerations up but also like you it needs to cool off! Love the renovations. Your house is gorgeous, as well as your family. Poor JM…that’s a big shiner. Love the decorations. Halloween is fun! Can’t wait to see what the kids are dressing up as! Love all your decorations! I assume you made those paper lanterns by just buying orange lanterns and modifying for the season, huh? Brilliant! 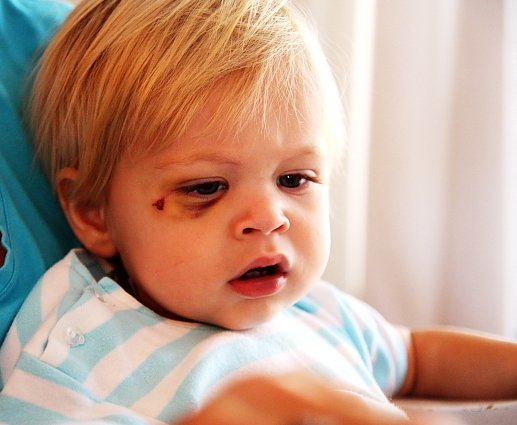 My 21 month old had a shiner like that a couple of months ago and I took pictures every day to show how quickly it healed. It was like watching time lapse photography! Boys sure are fun, huh? Your blog is such a fun place to visit! I absolutely love your Halloween decorations! 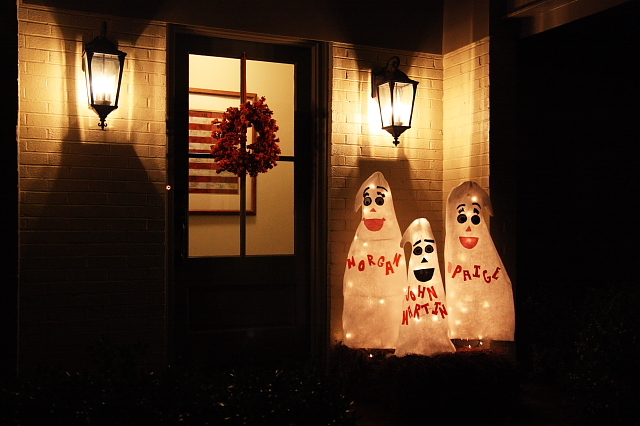 The house looks great…..cute idea to put the lights underneath/inside the ghosts. Everything looks terrific! I love the exterior of the house and think your Halloween decorating is really cute. 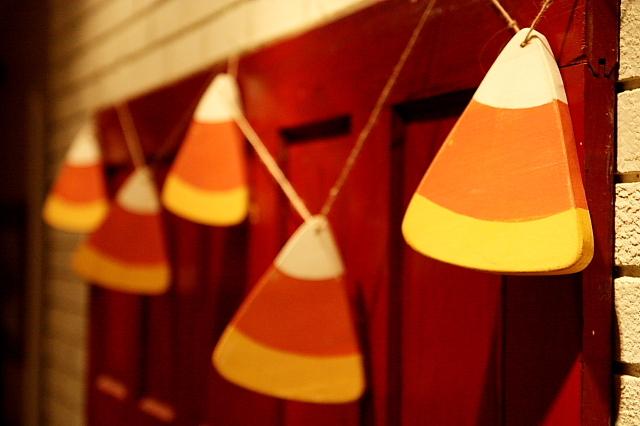 Will you share where you got the pumpkin paper lanterns? I love the jack-o-lantern paper lanterns and have looked for them but with no luck. Where did you find them?